In the past, I’ve drawn Maddie’s collection of stuffed animals at the foot of her bed. Here are previous collections. Her choices are typically based on the season and what she is playing with currently. Here’s this summer’s assemblage: (left to right: JDRF “Rufus”bear, American Girl doll named “Angelica”, blue bunny, funny face noisy critters, Madeline doll with “cow mask” resting on top of her hat, monkey webkins, ‘nother JDRF bear with a pink doggy squished in behind him, green fish, fluffy bunny and brown bunny with puppy in between, and “Snippy” the sea turtle, on the top (her absolute favorite who gets to sleep curled in her arms each night). I’m enjoying the multi-color line work these days. And to get colors close to what they actually are, I sat on her bed with my small watercolor palette and a waterbrush. This worked perfectly to keep from having to balance a jar of water and keep it from spilling. There are just a few dashes of watercolor crayons and a splash or two as well. Such a wonderful group of Friends! Maddie will treasure this. I love how you manage to capture a moment in time with your sketches. 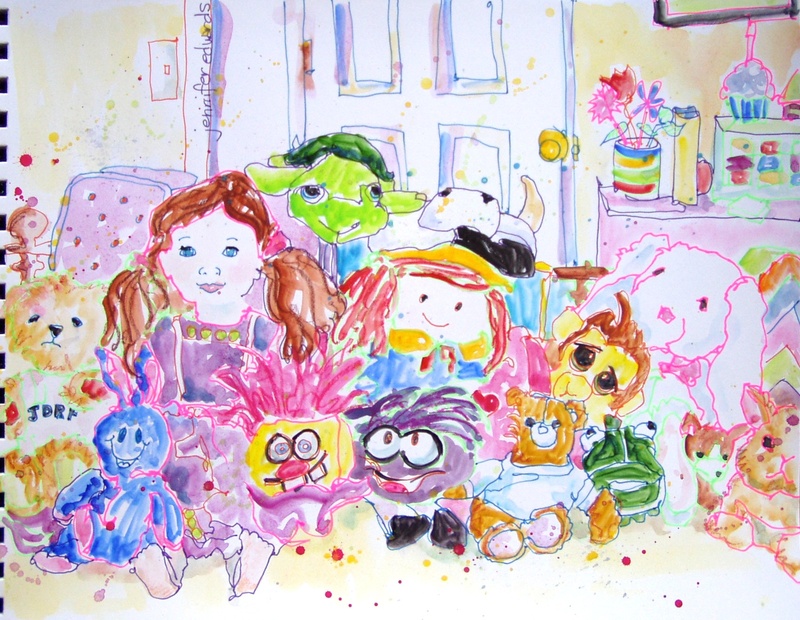 What a sweet collection of toys, reminds me of ET…there’s a little alien in the back row! What a neat picture. What a keeper too. I used to have bunches of dolls and after I left home my dad thought I didn’t want them and gave them away. It would have been nice to have at least had a picture to remember them by. Oh, I AM sorry to hear about the loss of your dolls…I kept all of mine, and all the ones I made too…and I love bringing them out from time to time for my girls to play with and just to reminisce. I do remember a stuffed orange bear (kinda large) that did get thrown away at some point because I just “loved him to death”. All the fur came off, eyes too, etc. But it would be fun to have it today even so! I love how you played with the line colors. Fitting for the subject! Well done!